So chatting over the Xmas holidays me & my 2 brothers have decided to do a few days away riding the South downs way. We are starting from Winchester and aiming to finish in Eastbourne (100 mostly off-road miles) 2.5 days later. It's supposed to be fairly hilly route so we have split it into 3 days (40 miles max a day) with a b&b stop each evening. As of a few weeks ago I'd not ridden a bike in ages, 3 years ago I'd herniated a disc in my lower back and cycling hadn't been on my radar much. But things are a lot better now, and I firmly believe in setting yourself challenges so this is my next one . 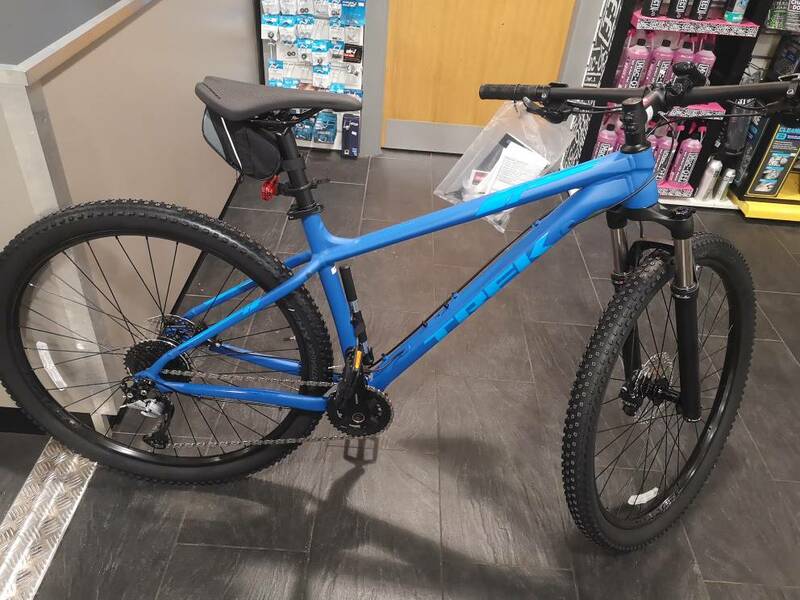 Ive been out and bought myself a decent mountain bike last week, it's certainly slower than my old road bike but it's v comfy and I think with sensible training the 100 mile will be a walk in the park sort of! Used to be a serious cyclist way back. During my formative years, next to music, hifi and F1, cycling was my passion, I rode my bike everywhere until I came to London just before my 17th birthday. I started up again in my mid 20's as I'd bought my first place and got into debt which meant my lovely Astra GTE 16v had to go. My folks then treated me to a bike to save me the hassle and frustration of long waits for the bus to theirs on a Sunday for dinner etc. My brother treated himself to something similar to yours about a year back, all black and stealth like. Felt very good to get back in the saddle. About 5 or 6 years ago I was riding a fair bit in sportives and triathlons but that was on road. Im feeling really enthusiastic about getting out and seeing some countryside by mountain bike. Also spending 3 days riding with my brothers will be a real laugh, something I doubt the 3 of us have done since we were kids. There will no doubt be a bit of a competitive element amounst the laughs! We are now all on Strava (activity logging app for walkers, runners, cyclists etc) so there's already plenty of "banter" between us. Good one Ben! Avid cyclist here as well . Mostly MTB; rarely road, although I do own a decent road bike. But I LOVE riding singletrack through the forests here. One of my happy places . I ride at least 2x per week spring summer and fall, and even a few times in the winter when there's only an inch or two of snow. In fact, my mtn. bike looks a lot like yours - Trek Superfly hardtail. Love that bike! So much fun. Are you going to be riding yours off road on mountain bike trails? Or mostly on the road and gravel paths? I'm guessing at 40 miles per day you're talking road here . I don't think I'd survive 40 miles of pounding on singletrack. No it's all off road, I'm not sure what you call it exactly but from what I've seen on YouTube the route looks like rolling tracks & feilds. Sounds wonderful Ben. If it's a popular cycling route then it's probably not mtb singletrack of the gnarly kind. That kind of stuff (rocks, roots, logs, steep climbs...) I can manage about 15 miles max. before I'm whacked. BTW, if you're riding mostly smooth gravel and asphalt, you might think about swapping out those knobby tires for some with lower rolling resistance. Will save you a ton of energy, esp. over the distances you're talking about. Check out Chain Reaction or Wiggle for great deals, or your local bike shop. Let me know if you need some advice, and I can recommend a few models. cheers for the advice mate. I'm planning on using the new bike for mainly off road stuff, footpaths, canal paths, forrest tracks etc as I need to get used to the terrain and for this upcoming trip. I know what your saying about the tyres, my wife was on her road bike yesterday and it was a real effort to keep up with her! I cycle a lot weekly mainly on roads and roughish tracks that can be really rough (sand/soil/rocks - combined) tree roots/grass/mud/more mud etc etc. I use a hybrid with tyres that I suspect hard-core off roaders would piss themselves at. However, they are great both on and off road and I have not had a puncture yet and have used the same tyres for a couple of years. I rebuilt an MTB that my son broke. It has massive knobbly tyres and is a PITA to get any decent ride out of on the road and not that great off road.